Lennie Peterson has dedicated his life to visual art, music, and arts education traveling the world several times as a visual artist, composer, performer, arranger, producer, educator, recording artist, and public speaker. Lennie Peterson was an Assistant Professor of Arranging and Composition at Boston’s Berklee College of Music. He created and developed new courses and instituted programs that remain in the Berklee curriculum to this day. Peterson traveled extensively with “The Berklee All Stars”, an international outreach program presenting clinics and performances with Berklee faculty while recruiting students nationally and abroad. After eleven years at Berklee, Peterson took leave to further establish his career in the Arts as a freelance educator, visual artist and musician. Since leaving Berklee, he has toured the world as a performer, conductor, recording artist, music and film consultant, teacher and producer in a wide variety of musical genres and settings. He also tours as a trombonist with Grammy winning composer Osvaldo Golijov’s “La Pasión según San Marcos”, appearing with some of the world’s most renowned symphony orchestras. Performances include New York’s Carnegie Hall and Lincoln Center, The Sydney Opera House in Sydney, Autralia, The Walt Disney Concert Hall in Los Angeles, London’s Barbican Center, The Vatican, and the Tietro Colon Opera House in Buenos Aires. Peterson appears on the Deutsche Grammophon recording and DVD of “La Pasión según San Marcos” released in March of 2010. 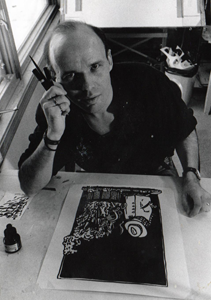 Peterson’s award-winning artwork has been featured in solo and group exhibitions in galleries throughout the United States including two solo exhibitions at the Angel Orensanz Foundation Center for the Arts in New York City and a two month solo exhibition at Harvard University’s Three Columns Gallery. Other exhibitions include the Ceres Gallery in New York City, The Williamsburg Art and Historical Center, and the Littlefield Gallery in Brooklyn, New York. Peterson’s art has been purchased throughout the world including Japan, Spain, and Wales. His Composer Portraits are currently featured in a 24-month solo exhibition at the new Boston Convention and Exhibition Center in Boston, MA. Lennie Peterson’s Composer and Musician Portraits pay tribute to the artists who have shaped the world around us through their music and include renderings of Beethoven, Franz Schubert, Miles Davis, Billie Holiday, and Thelonious Monk. The original works are meticulously hand-drawn with pen, ink and oil paint and stand six feet high by three feet wide. They are then reproduced using the giclee printing process on gator board to any size up to 8 feet in height. The portraits are available for exhibition as well as indoor/outdoor high definition projections that can range from 10 feet to several stories high. Peterson is also available for commission of new works. Peterson’s illustrations have been featured in publications and web sites around the world. “The Big Picture,” Peterson’s nationally syndicated daily comic strip, appeared in more than 100 newspapers and was published as a book collection by Andrews/McMeel Publishing. In addition, he has written and illustrated nearly a dozen books published by CCC Publications. A children’s book, illustrated by Peterson, written by veterinarian/author Monica Mansfield and published by Bean Pole Books, was released in the Fall of 2011. Lennie Peterson is available for public speaking and workshops that demonstrate his improvisational creative process and the blending of the two art forms of music and visual art. He uses this metaphor of improvisational creation to encourage his audience, artists and non-artists alike, to keep an open mind to living their daily experiences in a more spontaneous, trusting, and instinctual manner. Peterson has been a guest speaker to groups of all ages at public and private grade schools, colleges, universities and corporate gatherings including Harvard University’s Mather House, Colubris Technologies, and RSA (EMC Corporation’s security division). The interactive events use the live demonstration of music, art, and improvisational skills. Adding to Peterson’s public speaking skills is the injection of humor into his presentations. Peterson's nationally syndicated daily comic strip, “The Big Picture”, appeared in more than 100 newspapers and was published as a book collection by Andrews/McMeel Publishing. In addition, he has written and illustrated nearly a dozen humor books published by CCC Publications of California. Lennie Peterson was born and raised in Central Massachusetts. His father is a musician and his mother was an artist. He currently resides in a coastal community south of Boston, Massachusetts and he spends his spare time camping, hiking, and parachuting.